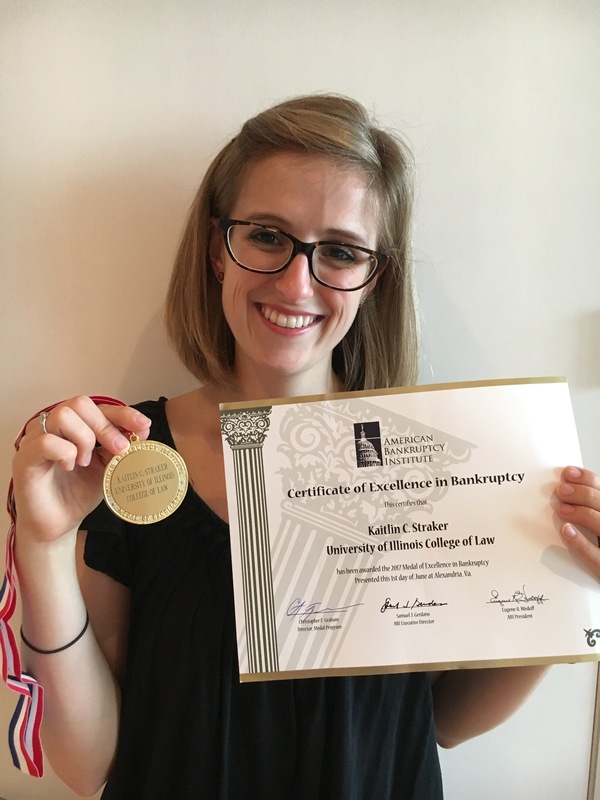 Kaitlin C. Straker (’16) has been selected to receive the 2016 American Bankruptcy Institute Medal of Excellence. The award honors a single student who has achieved the highest grade in their bankruptcy courses or has achieved other recognition through either a professional project or other dedication to improving the bankruptcy laws and the bankruptcy bar. Professors Ralph Brubaker, Robert Lawless, and Charles Tabb nominated Straker. Straker was the Notes Editor for the Journal of Law Technology and Policy; the President of the Environmental Law Society and the Energy Law Association; and received the CALI Award for Excellence in Oil and Gas Law, Natural Resources Law, and Secured Transactions. She is an associate at Schiff Hardin in Washington, D.C.